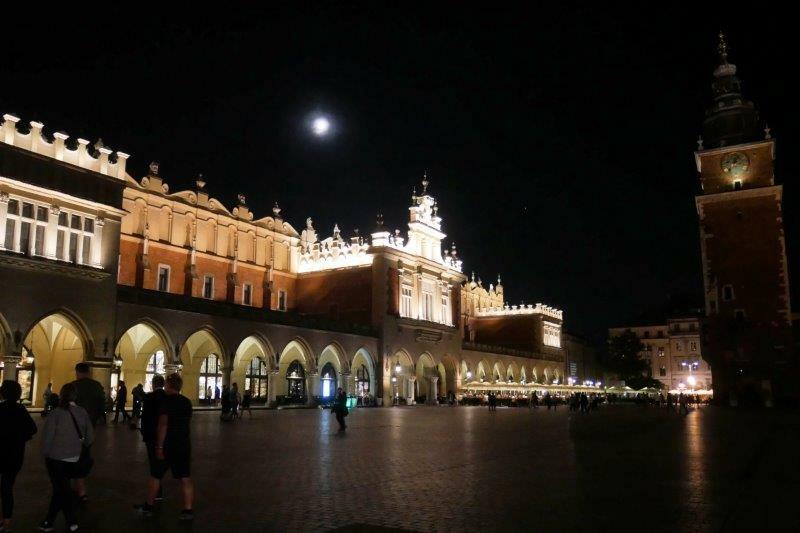 Our next stop was Krakow, Poland. Susan was in Krakow about 5 years ago with her Mom on a tour, loved the city, and thought Mark needs to see it. Off we go from Riga to Krakow. No problem taking the tram to the bus station and taking Bus 22 to the Airport for about $1.25 each for a ticket. The bus wandered through the city and country and dropped us off right in front of the terminal. We were first in line to check in at LOT airlines. The one hour flight from Riga to Warsaw was OK.
Come boarding time for the Warsaw to Krakow flight, we went to the gate (Shared door for Gates 36 and 37) and stood by the group 1 sign (Group 1 was on our boarding pass.). At our boarding time, a plane came into Gate 37 – we are at Gate 36. The gate agent put a Disney line strap up to separate the gates but Gate 36 didn’t/couldn’t board until all of the Gate 37 people got off or at least that was our explanation. THEN there were no boarding groups called – everyone just used 2 machines to have the boarding passes checked. I got behind some old lady who had to quiz the gate agent about, I’m guessing, her bags and where she would get them. Even in Polish I could understand “baggage” and “Krakow” repeated several times. We FINALLY got through the gate and ended up boarding a bus to be taken to the plane. No matter how many times I have to use this bus boarding system, it rarely gets more efficient and this was one of the MOST inefficient boarding we’ve done. Once the bus arrived at the plane on the runway, they only had steps up to the front entrance on the 737 (Using front and back entrances with good directions for which rows should use which door works pretty well – SAS in Stockholm for example). Polish LOT passengers carry as much, if not more, luggage on board than Americans – hard to believe, right?? The first bus of people boards the plane only to find out there’s ANOTHER bus of people we’re waiting for. It shows up in about 15 minutes and the inefficient boarding starts again but now there’s even less overhead space than before. The flight attendants actually went through the bins and made anyone who put items that fit under the seat do just that – put the items under the seat in front! We finally got out of Warsaw and landed in Krakow about 40 minutes late after the pilot landed the plane at a pretty fast speed and bounced it on the runway. Mark sat next to a LOT pilot who said nothing during the flight or landing. Luggage took a while to show up so we opted for a taxi to the AirBnb. The taxi driver could rival Paris taxi drivers. Mark went to Auschwitz and Birkenau on Thursday morning. Susan passed because I saw it with Mom and visiting this concentration camp more than once is more than I can handle. We’ve been to Dachau in Germany and Terezin in Czech Republic and three concentration camps is overwhelming. Visits to them are mandatory for school children in their respective countries. Entrance to the Auschwitz Concentration Camp in Poland. Over 1.1 million men and women lost their lives here. 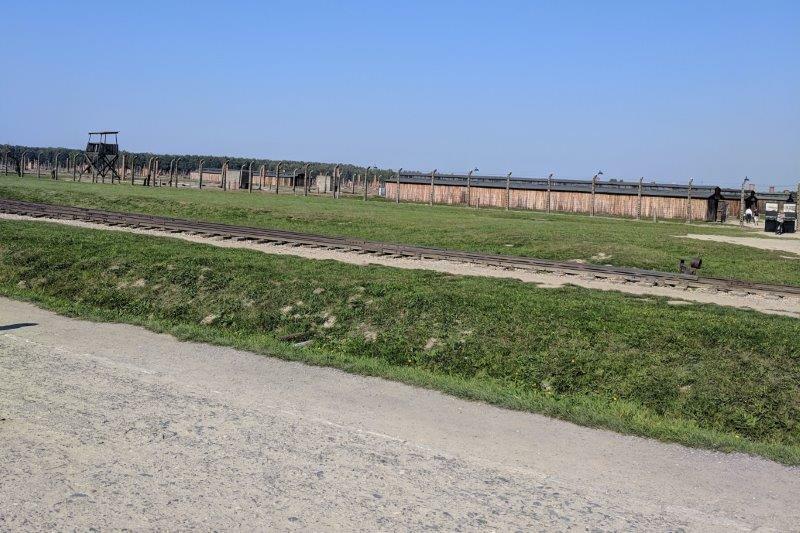 The remaining buildings of Birkenau Concentration Camp. The next day we took a tour to the Wieliszcka Salt Mine. 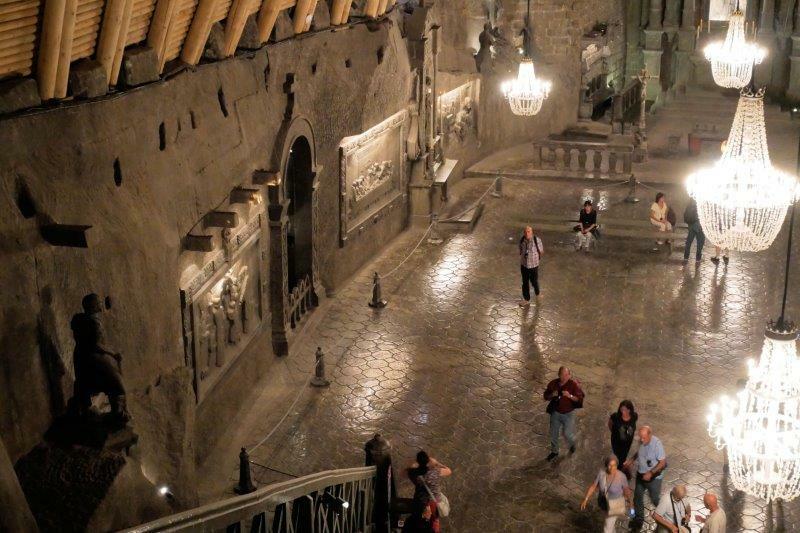 The tour took us down to 136 meters underground, using 800 steps to get there. Yes, we took an elevator back up! The tour took about 2 hours underground and we walked 4 km. It’s a fun place to see! 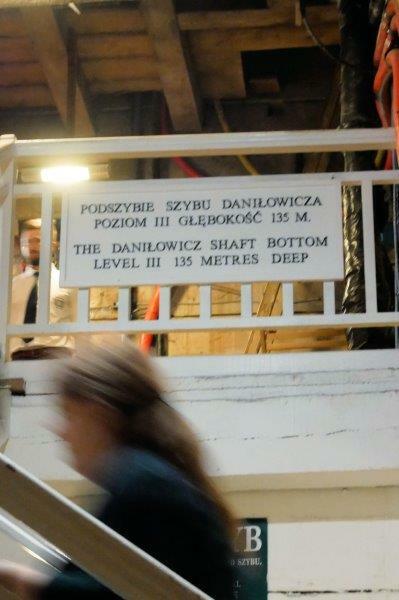 Our deepest point in the mine – 135 Meters. It took 800 steps to get down here and a mine elevator to get out. 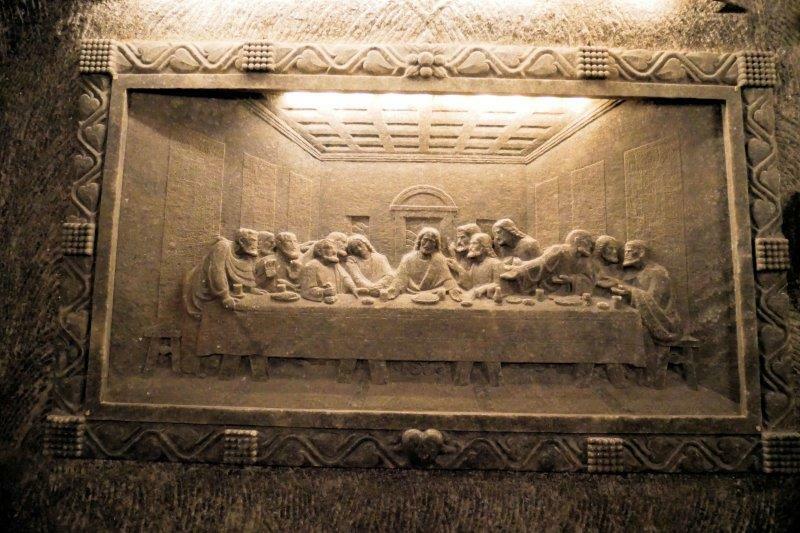 This chamber of the Salt Mine was made into a Chapel after the salt was gone. Mass is said here every Sunday about 7:30 AM. 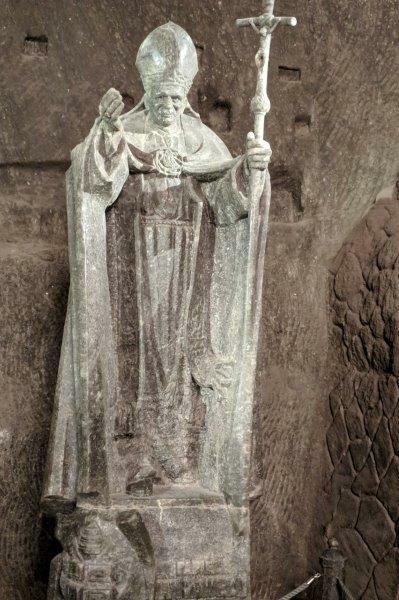 Pope John Paul II is quite popular and the chapel in the Salt Mine had this salt sculpture of him. Saturday was our day to wander around Krakow hitting all the hot spots and who knows how many churches. 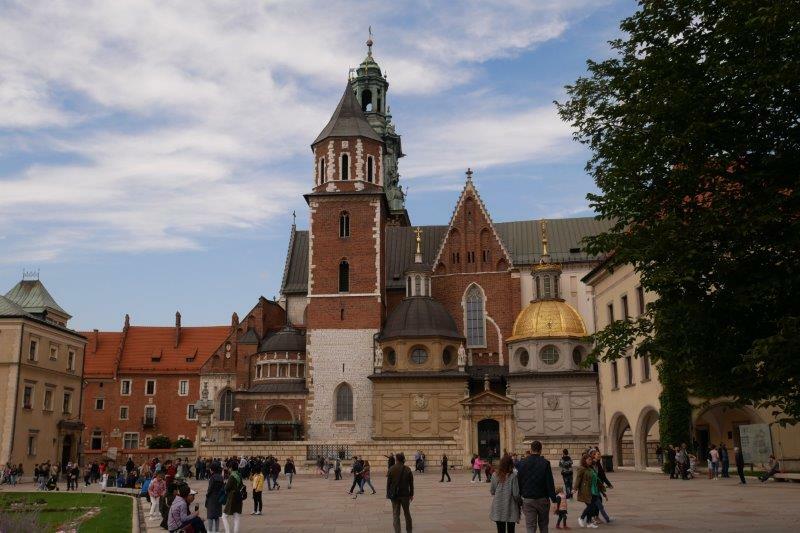 Poland is VERY Catholic with more churches per capita than any city outside of Rome. In the countryside 90% attend Mass on Sunday; only about 40% within the cities. At one point we could see 5 churches from where we stood! We walked up to the Wawel Hill to see the Cathedral and Castle Grounds overlooking the Vistula River. Had to check out a few markets, too, and do a little jewelry buying. Cloth Hall and Square sitting under an almost full moon. St. Maria’s Church. The day we tried to visit the church was closed for renovation work. Wawel Cathedral. You can tell from all the different spires that it was added to over the years. The kings of Poland are buried here but we skipped that part of the church! 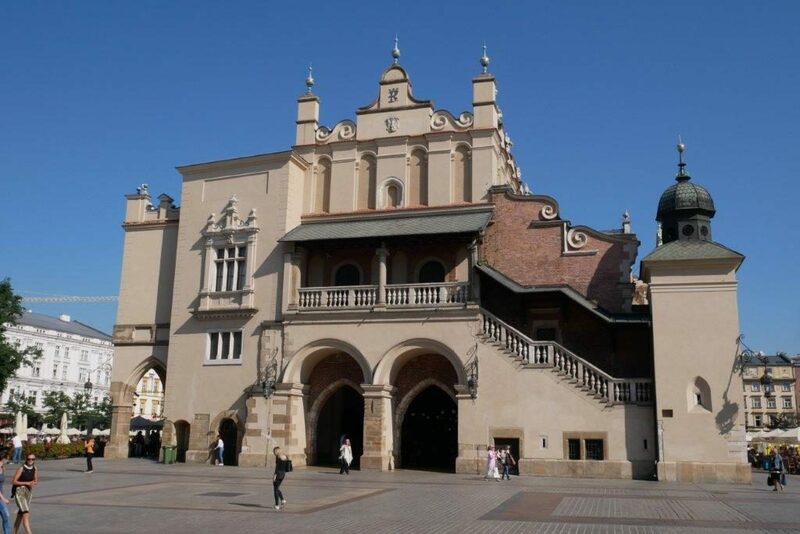 The old Cloth Hall now filled with stalls selling all sorts of Polish merchandise and souvenirs. 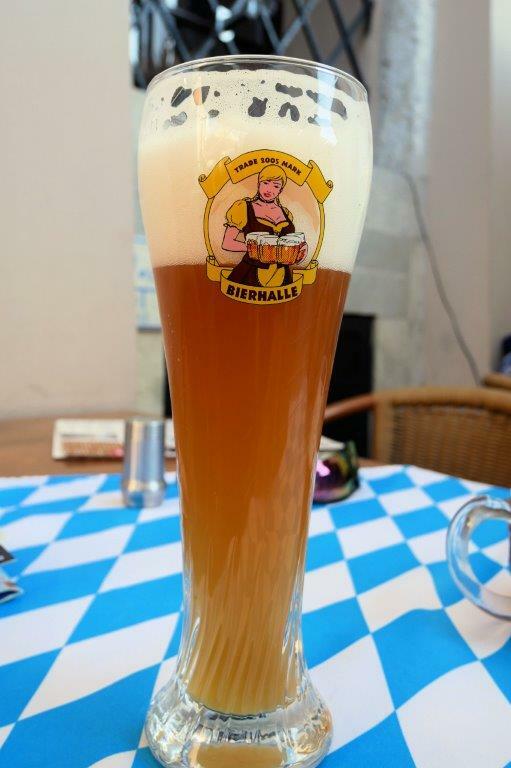 The weather was perfect for sitting outside and enjoying a wheat beer from a local brewery. 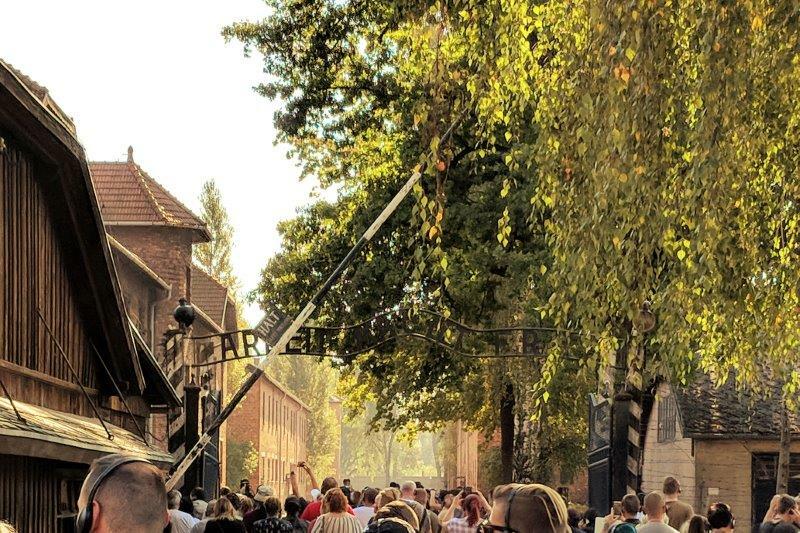 Today, we walked to Kazimierz, the Jewish Quarter, where only about 3,000 – only 5,000 out of 60,000 people survived from the German Occupation. Kazimierz is also an up and coming area of the city. We ran into a field of food trucks and had a hot dog for lunch. 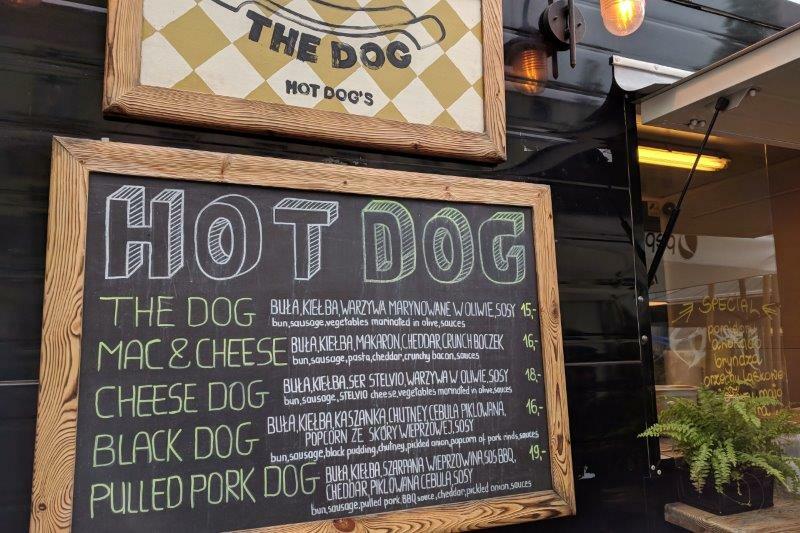 It was really a sausage and tasted nothing like a U.S. hotdog. One thing we’ve noticed in Krakow is a lack of traffic signals and walk signals to control people crossing the street in front of cars, trucks, buses, trams. People pretty much walk where and when they want creating traffic havoc. We can’t figure it out! Next stop is Munich for Oktoberfest.